Hey all!!! 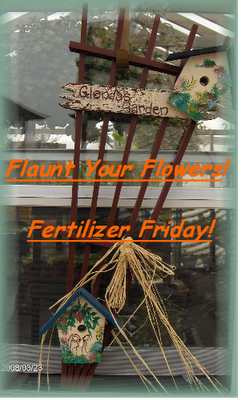 It is Friday and that means it is Fertilizer Friday....and we get to feed and Flaunt our Flowers!!! Grab your feeders...and get busy feeding your houseplants and gardens. After you are done ...grab your camera and take some photos to flaunt with me! Link yourself up to the mister linky below...grab the photo above and link that back to my blog...share your garden with the rest of the beautiful and talented gardeners out there! Look at the progress on this Beta Grape (I thought it was dead)! That garbage pot again....not so trashy now at all! Big bike bed...wish I had gotten a better angle! The Lavatera under the garage windows finally took off ....AND is blooming!!!! Heliotrope is finally showing itself off!!! Had to raise up my big pots...they were dragging on the ground. The wind from last week's storms has done some damage to the shape of them...but they are still alive! The bench is sure filling out nicely too. Nicotana, marigold, snap dragons....and what's that I see????? Monkshood making his big grand entrance!!! Side garden....that Malva is sure a healthy volunteer!!! another view of the big pots...see the damage from the wind? Oh well....they still rock!!! While I am trying to do anything....this weed-like terror stalks and helps me. He loves the keyboard of my laptop. He's growing like weeds...and even knows how to walk on a harness with a leash now!!! He's a regular bug! Okay....link up ladies and gents!!! I wanna see what you have to flaunt this week!!!! Remember ...there is no such thing as an ugly bloom...garden or plant!!!! Please do share with us! I will do my best to get around to see everyone...internet is sporadic here the last few days!